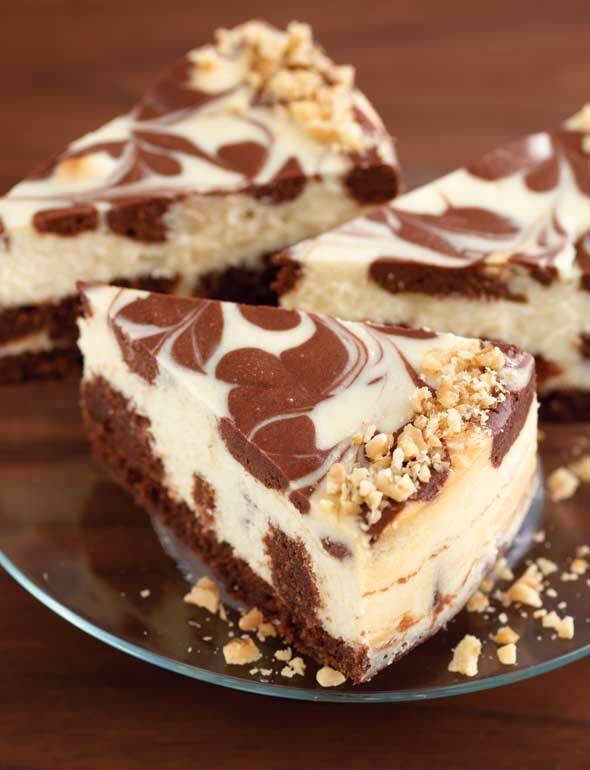 The highlight of this indulgent brownie swirl cheesecake is its dark chocolate brownie crust and blobs of brownies baked right into the cake. On top is a titillating swirl of bittersweet chocolate. 1. Preheat the oven to 350°F (175°C). Generously butter the bottom and sides of a 9-inch springform pan and an 8-inch square baking pan. Line the baking pan (but not the springform) with parchment or waxed paper, leaving a 1-inch overhang over the sides. Wrap the outside of the springform with aluminum foil, covering the bottom and extending all the way up the sides. 2. Melt the chocolate with the butter and let cool. In a small bowl, combine the flour and salt. In a large bowl, beat the eggs with an electric mixer on high until light yellow and thick, about 3 minutes. With the mixer still running, gradually add the sugar, then the chocolate mix­ture and vanilla. Reduce the speed to low and blend in the flour mixture just until it disappears. 3. Spread 2 cups of the batter in the springform to make the crust and the rest in the baking pan. Bake just until set around the sides, about 10 minutes for the crust and 25 minutes for the baking pan. (The centers will be slightly soft.) Let cool on a wire rack for 1 hour. Leave the brownie crust in the springform. Lift the brownies out of the square pan onto a plate, using the paper hanging over the sides as handles. Cover both the crust and the square of brownies with plastic wrap and refrigerate overnight. 4. Cut the square of brownies with a serrated knife into 1-inch squares and set aside. 5. Put one package of the cream cheese, 1/3 cup of the sugar, and the cornstarch in a large bowl. Beat with an electric mixer on low until creamy, about 3 minutes, scraping down the bowl several times. Blend in the remaining cream cheese, one package at a time, scraping down the bowl after each one. 6. Increase the mixer speed to medium and beat in the remaining 1 cup sugar, then the vanilla. Blend in the eggs, one at a time, beating well after adding each one. Beat in the 2/3 cup of cream just until completely blended. Don’t overmix! 7. Transfer 1 cup of the batter to a small bowl and set aside for the chocolate swirls. 8. Cover the chocolate brownie crust in the pan with small brownie bites (12 to 16), covering as much of the crust as possible. Use only one layer of brownie bites in order to leave plenty of room for the cheesecake batter. (Eat the rest of the brownies!) Gently spoon the white batter over the brownie bites. 9. Now make the chocolate swirls. Melt the chocolate and stir into the reserved white batter until completely blended. Using a teaspoon, drop the chocolate batter on top of the white batter, pushing it down slightly as you go. Using a thin, pointed knife, cut through the batter a few times in a swirling figure eight design, just until chocolate swirls appear. 10. Place the cake in a large shallow pan containing hot water that comes about 1 inch up the sides of the springform. Bake until the edges are light golden brown and the top of the cake has golden and dark chocolate swirls, about 1 1/4 hours. Remove the cake from the water bath, transfer to a wire rack, and let cool for 2 hours (just walk away — don’t move it). Leave the cake in the pan, cover loosely with plastic wrap, and refrigerate until completely cold, at least 4 hours or preferably overnight. 11. To serve, release and remove the sides of the springform, leaving the cake on the bottom of the pan. Place on a cake plate. Brush the remaining 1 tablespoon cream in a 1-inch border around the top edge of the cake (this helps keep the nuts in place). Sprinkle the walnuts over the cream, pressing the nuts down gently, making a 1-inch border around the top outside edge. Refrigerate until ready to serve. Slice with a sharp straight-edge knife, not a serrated one. Cover leftover cake and refrigerate, or freeze up to 1 month. 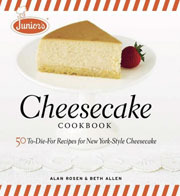 Junior's Brownie Swirl Cheesecake Recipe © 2007 Junior's Cheesecake, Inc. Photo © 2007 Mark Ferri. All rights reserved. All recipes and photos used with permission of the publisher.